I often meet with doctors and nurses in my job at DHMC, but I rarely get to see them in action. One of the pleasures of this trip has been watching them access their vast store of knowledge, witnessing their eagerness to help wherever possible, and enjoying their excitement over unusual cases. Typical post-clinic conversation: “Did you hear that whopping heart murmur?” Nods and grins all around. At our morning huddle on Saturday, some of the clinical folks expressed that they feel like they’re “not doing a lot medically.” They have few, if any, of the diagnostic and treatment capabilities available to them at DHMC, and so are very limited by the care they can provide. After talking things through, we were reminded of several things: that the clinicians did send two people to the hospital from our clinic at Arroyo Vuelta on Friday. One with upper GI bleeding, and the other with a high blood glucose reading (note: I’m already picking up the lingo). That proper hand-washing and clean water supplies would make a bigger difference than massive deliveries of medicine or superman-style interventions. And also that we need to make peace with our limitations. Not that we should stop caring, or trying. Rita told us the parable of the boy who walked along a beach, deliberately throwing starfish back into the ocean. Ahead of him, thousands and thousands of stranded starfish waited, slowly dying in the sun. An observer asked the boy what difference it made to throw one starfish back, when there were thousands that he could never save. The boy looked at the person after he flung another starfish back into the surf: “It mattered to that one,” he said. 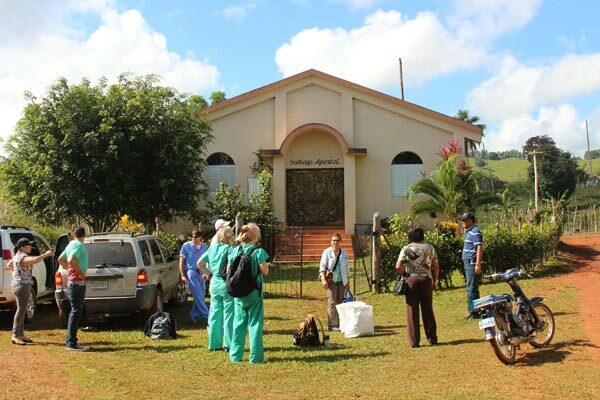 We boarded the SUVs – driven by local volunteers – to our clinic in El Cotorro. We turned off the paved road and enjoyed a very different topography than the locations of our previous clinics. Instead of the shaggy hills and eroded earth of Las Guyamas, we drove past groves and groves of fruit trees, with old coffee sacks stuffed with oranges on the ground. We were in a broader, sunnier valley, and even the air felt fresher. It was the sort of place that could easily give rise to ruminations about the pleasures of the simple life, until you started asking medical histories. Our visit had not been announced; Rita relies on local groups to set up and communicate the clinics, and at times, that communication is not as ideal as it could be. So a man on a yellow motorbike, wearing tall rubber boots, zoomed up into the hills to bring people down to the church where we were going to hold the clinic. Ana and I attempt crowd control and patient intake. This was our fourth clinic, and we had learned the importance of crowd control. We assigned a native speaker – Ana, who had steered her white SUV up the mud roads with one hand while clutching her pink cellphone in the other – to help me with patient intake. She asked the people their names, I asked them their medical issues, and wrote a brief summary in English on pieces of paper with numbers written on the back. The patients were to give their papers to the nurses and doctors stationed at tables and folding chairs inside once their number was called. I had a few simple questions to ask of people: any history of high blood pressure? Diabetes? The reason you’d like to see a doctor or a nurse? Although most had the same answers to my last question (dolor de estomago: stomachache, dolor de cabeza: headache), a few people spun off a litany of complaints that required all of my language skills to condense into three lines on a 3×5 card. They spoke to me as if I were a doctor, or someone who could fix the problems that have hounded them, and I just stood there like a boy on the beach who has no idea how to throw a starfish back into the sea. It was hot. People grumbled about being asked by Ana time and again to please form a line and wait their turn. I wrote and I sweated and I tried to decipher their medical complaints, hoping for comprehension to emerge from the fog of the thick Cibao accent. And then a young woman stood before me in a brown top, clutching a girl of about two. Is she sick? I asked. Why would you like her to see the doctor? She doesn’t eat much, the mother said. It was a common complaint; Jenny, a pediatrician, said that *all* of the children she had seen the previous day had parasites. I started writing the usual notations when the mother’s litany began to raise an alarm across language barriers. My girl is two years old, and she can’t sit up, the mother said. She can’t hold her head up, she can’t feed herself, she can’t walk. I raised my eyes to look at the girl, who lay limp in her mother’s arms. The mother received a number like everyone else, and took her place on the rows of folding chairs. Fifteen minutes later, as I took a brief water break at a side door, a tall man, with many missing teeth, touched me on the elbow and talked patiently, clearly, but with an undercurrent of desperation. He was the father of the girl. They’d tried everything. They’d taken the girl to another clinic, but the doctor there didn’t speak Spanish and they didn’t understand what the person said. Please help. And all I could say was for them to wait their turn and the doctors and nurses would see what they could do. Taking another break, a half-hour later, I saw the girl laying in Chris’ arms. 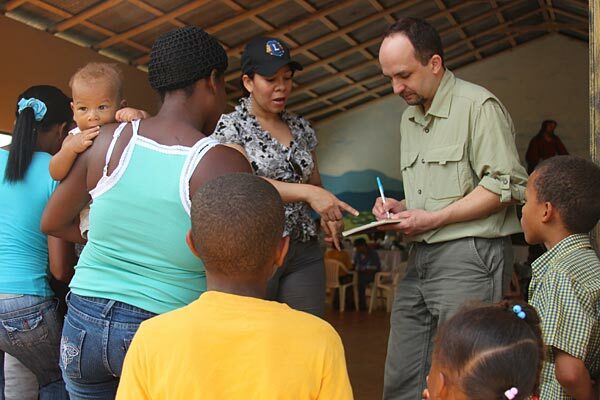 Chris cradled the girl’s head and cooed to her as one of the Dominican doctors talked with the mother. They spent a long time with the mother, possibly a half-hour, and when I later asked Chris what she thought the diagnosis might be, she surmised: cerebral palsy. Nothing we, or anyone, can do. Raeann bandaging the father's wounds. 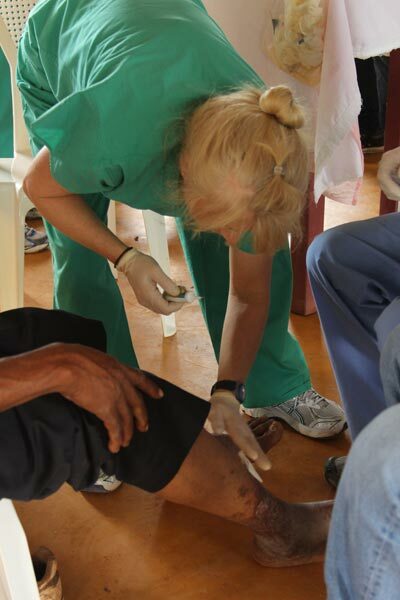 Toward the end of the clinic, I saw the tall man himself seated before Justin and Raeann, who was applying a cream to his calves, which were covered with splotchy scabs. Full of tiny flies, Raeann later told me. She suspected the cause may be venostatic ulcers, brought on by poor circulation potentially caused by heavy smoking. She wrapped the man’s calves in gauze, and Justin explained the importance of wearing socks to keep the dressing in place. When the clinic ended, Tom left to get shots of our SUVs leaving the back-road community. Dwayna and I decided to walk after him, to enjoy the spectacular countryside: lemon trees and passion fruit vines and banana groves. As we descended the muddy hill that Ana had so expertly ascended three hours earlier, two teenaged girls came trotting up behind us. The same girls who had asked us if we could stop by their house to enjoy some coconut water, an offer I had declined as politely as possible, as we had another community waiting for us in the afternoon and had to get back to the paved road. We walked with the girls, sweating, talking about cacao production, about the weather in Vermont and in Cibao. They stopped before an unpainted slabwood house, told us they lived in the house, and before I knew it, had two white plastic chairs set up in the shade for Dwayna and me. No harm to rest a little bit, to continue talking with them, to watch the tall man – the one with the bandaged legs – catch starfruit (carambola in Spanish) thrown down from his son in the trees. I took a photo of the two teenaged girls – dressed immaculately – smiling beneath a tree, then bid our farewell, wondering what was taking the SUVs so long. The man called after me: be sure to stop on your way out, for carambola. Which we did. They gave us half a coffee sack full, maybe twenty pounds of fruit, and Rita asked the mother of the limp girl for her phone number, to arrange for diapers for the two-year-old, and possibly some other help. The mother, who couldn’t be much older than 20, beamed, a terrific smile that warmed me to my core. “That baby gets a lot of love,” Tom said as we jounced toward the next clinic. Thanks, Chris. I really enjoyed traveling with you as well. Glad to get some more details about the time you spent with the girl. Ryan – You are an amazing writer!!! I feel very priveledged to have worked with you and grateful to you for capturing so many of the details of our mission in such a poetic manor! That little girl I held in my arms was in much need of daily ROM (range of motion) excercises to prevent her limbs from contracting – I spent some time with Mom teaching her some PT exercises for her to continue doing on a daily basis as she could not afford transportation for her to get Physical Therapy in the city.